Do you know what Sage Smudge Sticks – or Sage Bundles – are? And do you want to create your own Smudge Sticks? Smudge sticks are dried herbs that are bundled to create an easy way to light your sage and create cleansing smoke. You can use different herbs for smudging, and the some of most used cleansing herbs are sage, cedar and juniper. I use sagefor my Smudge Sticks. Sage is a herb with cleansing and healing properties. The word “sage” means a wise and experienced person – a guru. I add a bit of rosemary and oregano too, for the scent and to add their healing properties to my smoke. Sage is known as cleansing herb all over the world. We have especially adopted the tradition of burning sage from the Indigenous People in North America. Smudging is a ceremony where you cleanse a person’s aura, a home or office or an object to dispell undesirable energy with the smoke of a sacred plant. 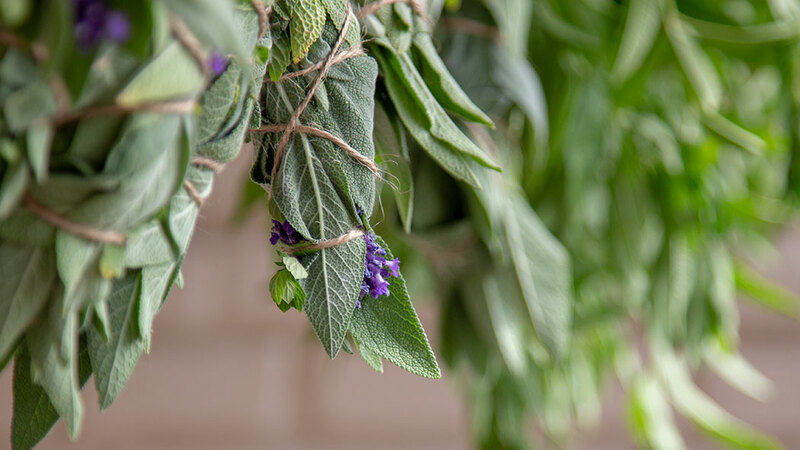 I the video, I show you step by step how I collect herbs for my Sage Smudge Sticks and create a bundle, that can be hung to dry. When your Smudge Sticks are completely dry, they are ready to be used for Space Clearing a house, a room or your office. You can also clear your crystals, you auro, your computer og your recycled furniture. Anything that holds old, stuck, unwanted og heavy energy will benefit from smudging. Be sure to have a glass of water ready to turn off your Smudge Stick when you finish smudging. Light end of your smudge stick (I’ll show it at the start of the video). Use a big match (instead of a lighter as I do) – it’s more ritual and original, I think. Let the fire grab the herbs and let them burn a little so that it catches a good flame. Then blow out the fire and use the smoke for the cleansing process. You can blow gently on the stick so that the smoke differs or you can use a feather to blow your smoke in the wanted direction. Put out the fire when done, use water, you can always dry your stick so that it´s ready for new Smudging. Air out when your´r done smudging if you smudge indoors, as the smoke is quite sharp. Please share your smudging experiences – or style questions – in the comments box below, or skip Facebook and post a comment on Joyful Living’s Facebook page.